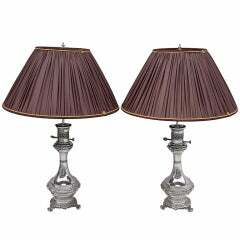 In vintage silvered finish, the metal table lamps from India comes with Belgium linen coolie style lamp shades. 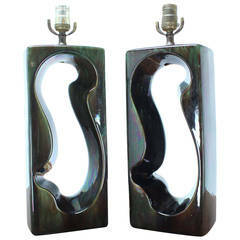 The Mellon shaped lamp has hammered surface with vertical ribbed details. Hollywood Regency Indian style ginger jar form. Measures: Lamp shade top - 4" Lamp shade bottom - 13.78" Lamp shade height - 5.38" Lamp base – 8 D x 10.7 H.
Very hot looking vintage circa 1970s glazed Art pottery table lamps. Dark olive green glaze. Golden metal table lamp with beautiful lampshade gold-tinted mirror effect inside.